Where’s the best place to elope? Southern California, of course. The sun, the California beach, the city buzz, the great weather, the movie industry – – -what better place is there? Run away and elope in Los Angeles or Orange County for your wedding. Looking for elopement packages? We can provide the license to wed, and it’s a confidential marriage license so you can keep it secret. 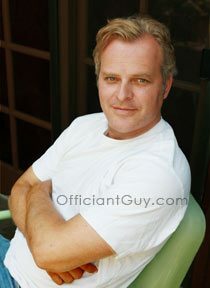 Officiant Guy can make it easy for you and officiate your elope wedding. Chris has married many eloping brides and grooms as he is a last minute wedding ceremony specialist! Many brides and grooms want a marriage license and officiant wedding package. 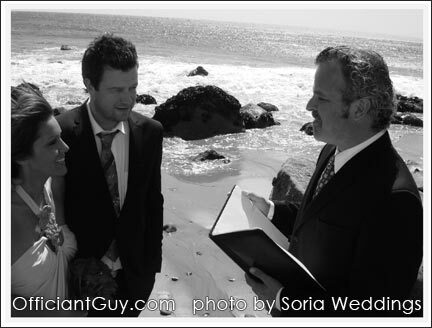 Our wedding packages are just that- – officiant and license. No waiting, no hassles. Very simply, we can help you elope in the best destination. 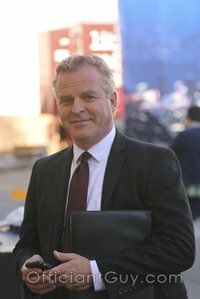 And Chris hand delivers your completed marriage license to the LA County Clerk’s office so that it won’t get lost in the mail. All you have to do then is wait 6-8 weeks for the marriage certificate to arrive in the mail to you. Chris has been across Los Angeles and Orange County many times over and can suggest a location if you’re not sure where to get married in Southern California. Just give us a call so we can officiate a California beach wedding or a Los Angeles hotel wedding or a restaurant wedding or your Orange County home, etc. The choice is yours. We’ve united many couples in places as simple as a coffee shop or a favorite bar. We can make your elopement easy. You can make it private, with just the two of you (see private wedding ceremonies) or with a few close friends. If you want to elope in Southern California, call Chris. If you wish to get married somewhere in Orange County, Los Angeles County, Ventura County, San Diego County, Riverside County, San Bernardino County and even Santa Barbara County give the number one wedding minister in LA County a ring at (310) 882-5039 or (562) 547-3255 or fill out the contact form. Chris Robinson, the Officiant Guy, is an LA wedding minister. He has been officiating weddings and issuing confidential wedding licenses for over several decades. He officiates many short notice weddings.